Steph Su Reads: The Dark Divine Nail Polish Giveaway! 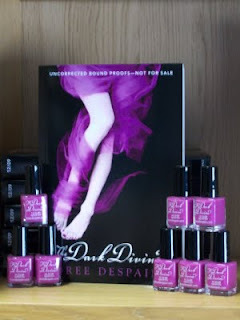 Thanks to the generosity of the awesome people at Goodman Media, I have FOUR (4) bottles of beautiful purple nail polish, the kind that the model on the cover of Bree Despain's The Dark Divine wears, to give to 4 winners! This nail polish will add some lovely color to your toes to usher in the upcoming spring months. I'm not really a nail polish wearer, but even I'm going to try this gorgeous color out! The Dark Divine is a story of forgiveness. Describe a time when you forgave someone, or someone forgave you, or you didn't give/receive forgiveness. No answer and no email address, no entry into this giveaway! Winners will be selected at random. There are no extra entries for this giveaway: you do not have to be a follower to enter. Open to US only (sorry, I don't want the bottles breaking if they have to travel any further!) and ends Wednesday, March 17, 2010. Happy entering, and I look forward to reading your stories of forgiveness! Well, on of my friends got me in huge (really huge) trouble for doing something I didn't do and I had to pay the price. The person at fault was this guy in our class who just happened to be the guy she liked. so basically to help him, she got me in trouble! it was proven that i was not at fault and he got in even more trouble than i had. but i never forgave her for choosing her crush over her friend. In 3rd grade, I unknowingly insulted someone's art project they made: a chicken coop (for some reason we were making small farm models...). My friend was so angry at me, but eventually forgave me because I was completely clueless (and hey, it was 3rd grade!). I usually forgive people pretty easily when they do something to me, as long as they apologize. The only time I ever really hold grudges is when someone does something to my family or my best friends. I'm much less forgiving in those circumstances. Well my story is kind of stupid. I was in third grade and my "friend" more like crush, started hanging out with the "unpopulars" and the "populars" me, him, and our other "friends" thought that was stupid. So, he really wanted to come back with us and he apologized a hundred times but know one forgave him. One day he came and apologized to me personally and because i didnt want to become "unpopular" i didnt forgive him. We were never the same. I waisted a perfect friend ship for some people who really werent our friends. To this day, I regret it. Well, this is pretty easy because about 5 minutes ago I forgave my son who I am a surrogate mom to (long story) for spending more than he had in his account-----again. When I was in 10th grade I was dating a guy and he was crazy. I think he wanted to blow up my high school at one point, but I'm not positive. Then he left during the summer. I haven't heard from him since. I never forgave him for just leaving me with unanswered questions. okay. So basically, my friend told everyone about a fake crush *it was the thing* and the boy confronted me about it. I was so upset that i judo threw her *im a tough cookie* she wailed about it and sued me for hurting her. *shrugs* but the point is she has never been forgiven for betraying my trust like that. ooohhhh I love my TDD nail polish!! The winner will for sure love it to I hope and have fun with it. I have it on my toes and fingers nails!! TDD is an AWESOME book and it Bree Despain is so dang nice!!! In HS I was having a really bad day and I flew off the handle at a friend who was actually doing something really nice. I thought there was no way she would forgive me, but she did! I learned that no matter how bad a day I'm having, taking it out on others is not good! Oops hit submit before email! I forgave my father for not being present in my childhood. Nail polish....I love the color. I can't really think of anything, but I do know that I forgive my parents no matter how they've never been there for me. Our school color is purple -- this nailpolish would be a big hit there. Forgiveness -- every day. My husband forgives me when I'm cranky due to hunger before eating. Oh gosh... I am reading this one now! Okay, forgiveness! When I was in 6th grade I did something that I have never been able to forget even though my friend has long since forgiven me. My friend is from Korea and has a Korean name (duh), Jeong Ah (Chung-Eye). Well other people in my school called her "Chunky Eyeballs." I stood up for her many times but one day at lunch I couldn't get her attention so I called her that! GASP!!! The look on her face was something I will never forget (I am 27 now and still see it as if it were yesterday). She immediately started crying and so did I because I knew what I had done. We both had to go to the principal's office and settle our issue and are still good friends today, but I learned that day that words hurt more than anything else. I hate it when people call each other names and my students know that is my BIGGEST pet peeve! Oh the forgiveness of a friend goes a long way! I have found a way to forgive everyone that needs it. If you hold grudges, it's like poison in your system eating away at you. Forgiveness is a must. I forgave my mother for her drug addiction. Forgiveness? I had to work hard at it, but I forgave myself for remaining in an abusive relationship. It took a long time, but I now see that it wasn't entirely my fault. I was best friends with this girl all through middle and high school. I was and will never able to forgive her because she would date a guy and forget her friends and family. Whenever she and the guy would break up and she needed a shoulder, we were always there. Then I needed her and she was too busy with her latest boyfriend to even talk to me. She'd ignore my calls but call me when it was convenient for her. Finally, she never called me back. To this day I miss her but I'll never be friends with her again. We had a common friend and he's told me she's asked about me but I'm just not interested in putting myself out there for someone who wants a friend but can't return the favor. Guys can come and go, but friends should be forever. She didn't see it that way. A little over a year ago I got in an argument with my best friend. She is a lovely person who shared a lot of the same interests as me, the most important being our love for YA and writing. We tried nanowrimo two years in a row together, rooting each other on, and often shared books. It was a great friendship founded over our first love, and then eventual dislike for, the series Harry Potter. We even got married on the same day. Anyway, she got pregnant and went through depression. I tried to be there for her, talk to her, help her, and every time I tried to listen or open up to her about my own battle with depression to give her hope or tools I used (her therapist told me to) she got angry. If I said something political on my blog she didn't agree with she got angry. During the Twilight midnight premiere, in which I was supposed to stay at her house for the weekend, she trashed me to her other friends and told me not to come over. Then sent me a nasty e-mail about how rude it was I didn't stay the weekend. I understood she was having issues and dealing with hormones, but it was a bit over the top. So I told her she was hurting my feelings with her bitchy attitude. She ignored me for 6 months. Did not respond to phone calls, text messages, or e-mails. I even sent her a Christmas present and didn't hear anything from her. After 5 months of not speaking, my birthday arrived. I saw her on facebook that day and a mutual friend posted a link on her wall reminding her it was my birthday, yet she didn't send anything or call or write me a message. Given up, and mutual friend telling me to just let her go, I unfriended her. :-( Two weeks later I get a notification she has updated her blog, first time since the original fall out. She posted a really hateful message about me unfriending her publicly and said she never liked me or cared anyway. I sent her an e-mail explaining my actions. She never responded. Mutual friend ended up taking my side and unfriended her as well because she told me that our friend told her at lunch after the incident some horrible things about me and the only reason my friend looked me up again was to send me an invitation to her baby shower because she wanted me to buy her a gift (since I am known to give good gifts) and if I had shown up she would have had someone ask me to leave because I made her uncomfortable. She was so offended that I unfriended her first she decided to make a public display of the whole debacle. After a few months, our favorite book (The Time Traveler's Wife) was turned into a movie. We had heard about it a few years before and talked about going together, but then the fallout happened. When the poster and trailer were released, I sent her a link in an e-mail and apologized. I told her I missed her, took the whole blame for the situation, and said I wanted my friend back. Never heard back. I imagined that she didn't even open the e-mail, but my husband who was still friends with her at the time on facebook said she posted a link about an hour after I sent the e-mail (and according to google talk that was when she was logged onto gmail) and said on the link "look what I found." *shrug* I still miss my friend and wish we could get along, my husband says I should let it go because it's better to have no friends than unappreciative, using friends. I still feel sad that nearly 5 years of very close friendship was thrown down the drain, and that apparently it was completely one sided, but I still miss her and wish we could be friends, even with her sometimes ugly behavior, because I really miss having someone to bounce writing ideas off of and share my thoughts with about YA books. I recently forgave my husband for coming home with a new puppy without discussing it with me first. There are many times I have had to forgive or be forgiven in my life but I would have to say that one of the hardest times was actually me needing a bit of forgiveness from myself. Throughout my life, up until recently I had a fear of wanting things. I was scared to put effort into anything because the more effort you put in, the more it hurts if you don't get what you were trying for. I had wanted so much as a child, not the normal things most would but to be a surgeon and then found out that because of my health conditions I would never be able to be. I was crushed and went on to try for something else, only time after time this continued to happen until recently when I met a wonderful person who told me to do it anyways. To let myself want it, and let it hurt me when I might fail and then turn that pain from failure into more fire towards success. I have to say, I don't regret trying so hard anymore. I have now written two novels and am on book three, trying to get them published is a hit to my confidence but I just do what he said and turn that pain into fire and let it feed my desire. I would love to win this nail polish! My e-mail is cherylbaryl@hotmail.com. My husband forgave me (a few times) for making bad money choices and running us into debt.